New Zealand has three main goldfields and each has its own geology. 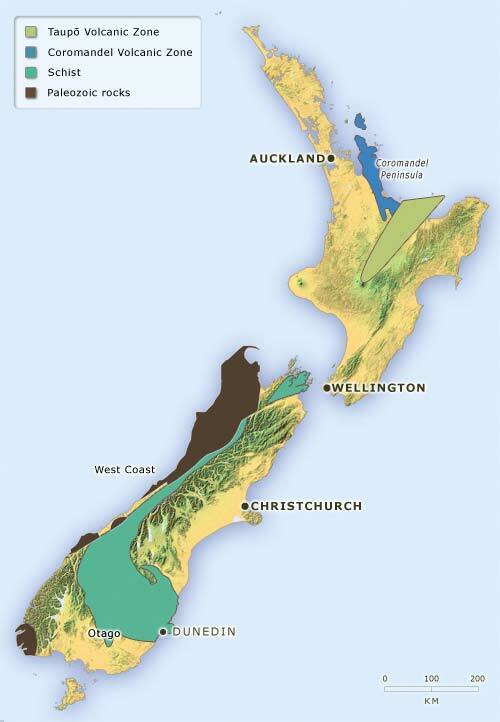 In Otago (and Marlborough) gold is found in quartz veins in schist and in river gravels which have weathered from schist. On the West Coast and at Golden Bay, gold is found in older Paleozoic greywacke and argillite rocks in faulted areas called shear zones. On the Coromandel Peninsula gold and silver are found in quartz veins within volcanic rocks. Although gold has never been mined there, it occurs in the Taupō Volcanic Zone in geothermal deposits.